Manufacturing wire harness and cable assemblies can be a complex process, but Omega Leads has the experience and knowledge to do it right every time. We strive to provide the highest quality wire harness and cable assemblies in the industry. We manufacture to the IPC/WHMA-A-620 quality standard. Contact Omega Leads today to learn more about our cable assembly and wire harness manufacturing process. Omega Leads’ custom manufacturing process doesn’t begin until we receive a request for quotation from a potential or returning customer. All RFQ’s are reviewed by our quoting department. We contact our vendors to negotiate material costs in order to secure best pricing. We have partnered with key vendors who have offered us special pricing, auto replenishment programs, and also discounted or free freight, thus enabling Omega Leads to provide very competitive pricing. Our quoting process is completed within 48 hours depending on the complexity of the assembly. Our team takes pride in every order, no matter how large or small, and strives to build a strong working relationship with each and every client. Our customer service department values every customer request and works to resolve each request in a timely manner. We have supported our customers with customized weekly open order reports and can create any type of report in order to help ensure your department’s visibility. Our customer service team is proactive in making each production project a success. Blanket orders are a great way to be proactive in this volatile materials market. We have found that blanket orders placed by our customers have allowed Omega Leads to hold the quoted price for the entire length of the blanket order. Delivery dates can be modified to accommodate a spike in business, without any added cost to you. When placing an RFQ, let one of our team members explain in detail how we can structure a blanket order to fit around your company’s demands. When our cable assemblies and wire harnesses have been manufactured, they undergo multiple safety checks to ensure the product meets all of our customer’s requirements. Safety is one of the most critical considerations when working with wire processing, and the manufacturing process never ends before the safety of our products is ensured. Before production begins on any part of the wire, or cable assembly key metrics are inspected based on the IPC/WHMA-A-620 quality standard we follow. All information is documented for future reference. Each wire harness, and cable assembly is inspected for visual defects, and every one is tested on one of our Cirris harness testers. Quality is critical during the manufacturing process. We are an ISO compliant facility with UL and CSA approvals. 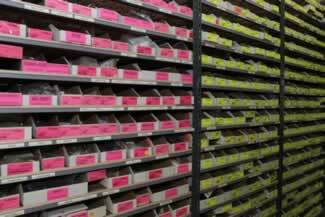 Our inventory and manufacturing processes comply with ROHS mandates. Visit our Quality page for more information. Omega Leads is committed to providing the best quality products for our customers. To learn more about Omega Leads’ processes and how we can put them to work for you, contact us directly, request a quote, or call 800-338-2536.